It is hard to imagine anyone who has not heard of the Dolby noise reduction process, even if he/she has no idea what it is. 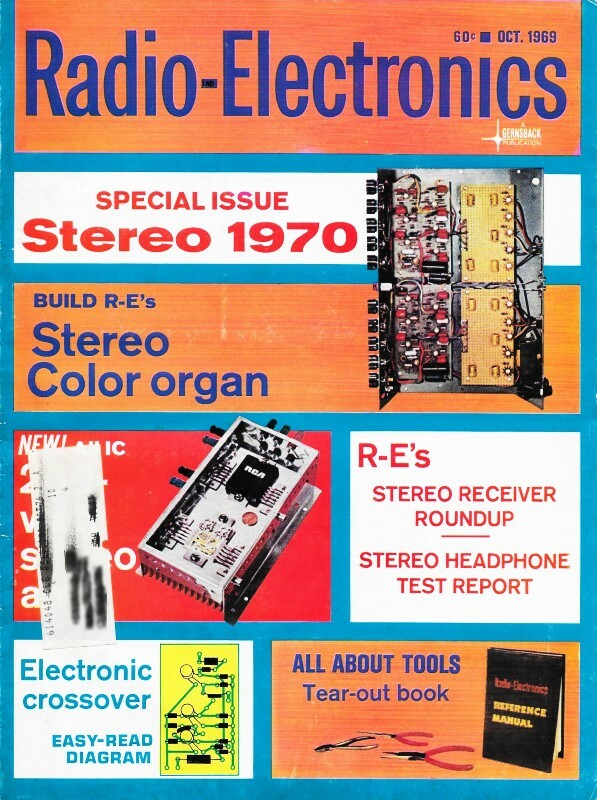 Dr. Ray Dolby developed his process in 1965, although it was not patented until 1969 - the year this article appeared in Radio-Electronics magazine. 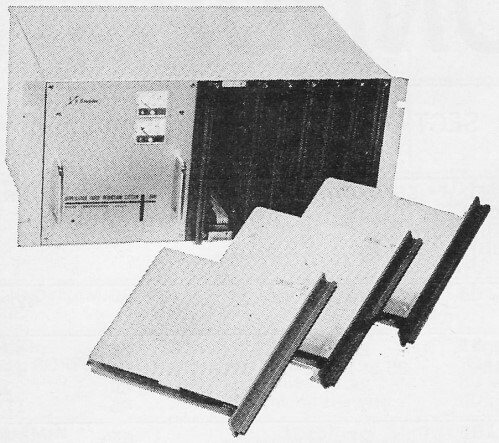 At the time, "Dolbyized" audio systems were not available in the consumer marketplace because the price was prohibitively high - $1,495* for a basic A301 system. 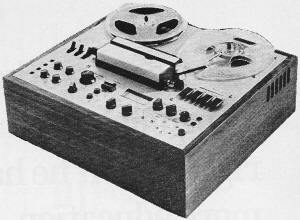 Only about 25 units per month were being produced, primarily for recording studios and reproduction factories. Dolby's magic that can reduce noise by 15 dB works on the companding (portmanteau of compression and expansion) principle, thereby eliminating or greatly suppressing the discernable "hiss." Dolby B is still the most common version in use after nearly half a century. * $1,495 in 1969 is the equivalent of $10,620 in 2018 money per the BLS Inflation Calculator. Rack-mounted A301 uses 4 plug-in PC cards for bands in identical stereo channels. Taking the hiss from hi-fi tape recording. Rapidly gaining acceptance by major recording companies, the Dolby system cuts tape hiss 10-15 dB and reduces print - through 10 dB. Although you need a 'black box' to hear a Dolbyized tape, prerecorded tapes are sounding better than ever. There's an ever-present annoyance with tape recordings. It's called tape noise. It takes various forms, with hiss being the most readily apparent to the listener. The other noises are tape recorder rumble and scrape, and that ever-present gremlin, print-through. These noises occur at the tape recorder as the recording is being made-or in the case of print-through, after the tape is made. The noise isn't present in the signal coming to the tape equipment from the mixing console; up to that point, the signal's nice and clean. Various methods have been tried to eliminate noise, hiss in particular - exotic filtering systems, compression or expansion amplifiers, and a variety of related devices. Manufacturers frequently announce a "totally new" noise-reduction system. Most of these systems work up to a point, but many inject "swishing" noises into the recording because of the compressor amplifier's relatively slow attack time. It can't react fast enough to the rapidly changing audio dynamics of the input. A tape deck using one Dolby frequency band to cut tape hiss is manufactured by KLH. Where are these tape noises most noticeable? You don't need a cram course in audio to know - it's always in the low-level music passages. In the loud sections of a recording, there are plenty of desirable decibels to mask any intruding noise, but hit that pianissimo section and suddenly the hiss comes storming through, along with print, scrape and rumble. If the intrusive noise could be drastically reduced in these low passages, so the reasoning goes, then the overall noise level would be reduced. Working on this premise, Dr. Ray Dolby developed his A301 noise-reduction system, and started manufacturing it in England a couple of years ago. This system is inserted in the signal path between the console and the tape equipment during the taping session. 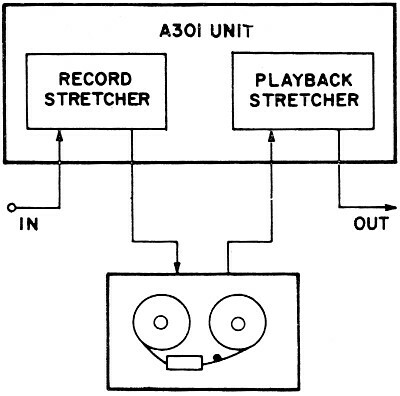 During playback, the tape's signal must pass through the A301 again on its way to the amplifier. A Dolbyized tape cannot be played back without the benefit of reprocessing by the A301. The A301 itself is actually a dual unit - two systems for two-channel stereo. The same stereo unit that's used for recording can be used for playback, simply by changing the connectors and flipping switches. The basic A301 is tagged at $1495, so it's not a toy that the casual home recording enthusiast can buy for his amusement. Tape-to-tape dubs do not require further Dolbyized (as long as tape-to-tape equalization remains the same). The overall effect is to reduce hiss and other noise factors by 10 to 15 dB! A listening test demonstrates its effectiveness graphically. A-B comparison with and without the A301 in the system makes one thing immediately apparent - with the Dolby, there's absolutely no discernible hiss, not one little bit of it. As a starting point, the Dolby system divides the audio spectrum into four frequency bands: 0-80 Hz, 80-3000 Hz, 3-9 kHz and 9 kHz to the upper limit of the audio spectrum. Crossover transitions between these bands are exceptionally smooth, with no measurable discontinuities or attenuation. Fig. 1 - System's feed-back loops provide necessary expansion and compression to override background noise. In the process of making a recording, low-level signals are boosted before reaching the tape recorder and compressed by an identical amount in playback. The expansion/compression moves the low-level signal up at least 10 dB. This 100 dB edge over intrusive noise is maintained during expansion. The net result is that noise level is at least 10 dB lower than without the Dolby process. 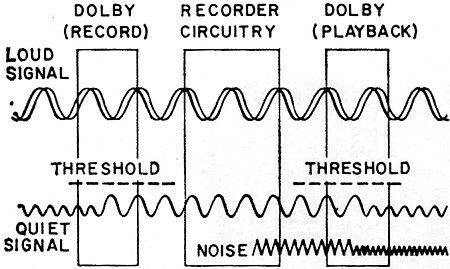 In his description to the Audio Engineering Society in 1967, Dolby characterized the basic elements of his black box as shown in Fig. 1. G1 and G2 are identical signal multipliers controlled by the signal's amplitude, frequency and dynamic properties. During recording, network G1 passes low-level signals to the adder, which adds a component (signal expansion) to the signal on its way to the recorder. During playback, G2 p passes low-level components to the subtractor, which partially cancels these noise elements in the signal. G2 also partially cancels low-level (desirable) signal components, thus offsetting (compressing) the signal that had been partially expanded through G1's action. Solving these equations, G1 = G2 and z = x. These solutions show that the output signal will equal the input signal if G1 and G2 are the same, provided G(z) does not become -1 (no oscillation) and the functions in (1) and (2) are continuous and single-valued - in other words, no tracking ambiguity. It looks fine on paper, and the proof of the math is in the listening: it works. In fact, it works so well that, in A-B tests, the listener can't help but wonder if someone hasn't jacked up the hiss level in the unprocessed tape - the difference is that marked and apparent. But no, there's been no monkeying with the tape - just the normal amount of dubbing and processing. 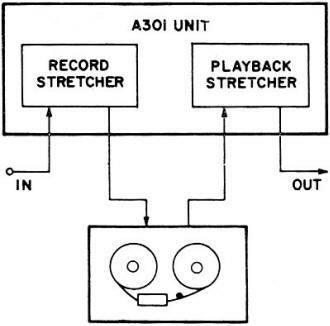 Identical A301 halves can serve for stereo or a record-playback monitor. A301 boosts low-level audio before recording, compressing it in playback. First to recognize the value of this new system have been the major recording companies. Since every recording-tape and disc - must first go through several generations of tape dubs, eliminating the noise that creeps into these transfers and mixes makes the final, non-Dolbyized product that much cleaner. True, the prerecorded tape purchased by the consumer has its own hiss and other noises, but all the preceding noise in the production chain has been eliminated. Thus, instead of a noise level as high as 10 to 14 dB, the finished product may have a noise level of only 3 dB - a more-than-tolerable level. Tapes commercially produced this way sound so good, in fact, that duplicators such as Ampex have started touting their remarkably noise-free quality. Although discs have had very low noise levels for some years, those pressed from Dolbyized master tapes sound notably quieter and cleaner. But it's no simple matter for a recording company to Dolbyize. First, there's the very limited production of A301's. Ray Dolby has a baker's dozen technicians in his London shop lovingly hand-crafting his A301's with a Rolls-Royce kind of zeal and perfectionism. Total production capacity now is about 25 units per month, and a large recording company may require at least that many units to handle its manifold operations. Dolby won't be hurried. He's a perfectionist, and he sees this perfectionism as part of his stock in trade. A brilliant designer, he was largely responsible for the development of the electronic circuitry for the original Ampex video tape recorders while he was still a teenage undergraduate at Stanford University. He received a PhD in physics from Cambridge in 1961. Actually, it's not a full-blown Dolby. 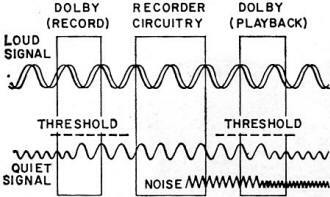 The machine just uses the third frequency band since this is where most hiss occurs, The KLH Dolby produces tapes recorded at 3-3/4 ips with no higher noise level than tapes recorded at 15 ips without Dolby treatment. The KLH Dolby does a dandy job of killing hiss, and could be a very worthwhile investment for the serious recording hobbyist who wants to maintain the best possible quality in his home recordings. But what happens when he wants to dub and maintain noise free tapes? Buy two KLH recorders? This might be what the Cambridge whiz-kids had in mind, especially since they have an exclusive license to use the Dolby circuit for manufacturing in the US. The Dolby system isn't a panacea. It can't clean up already recorded tapes. Its function is to process the sound going onto the tape, and then to reprocess it as it leaves the tape. It just won't clean up noise already indelibly etched in those oxide particles. Another problem: in today's ever-expanding tape channel capabilities, the A301's price and relative unavailability makes it impossible to use with the 8- and 16-channel audio mastering that is becoming more and more popular. This might involve having as many as 16 units in a single recording studio control room for making just one master tape. Fortunately, such multitrack originals are mostly used for "Acid" rock and other popular sounds which don't make very critical demands so far as recorded noise levels are concerned. It's in the realm of the serious recording - which is usually taped in old-fashioned, two-channel stereo - that the Dolby system can really come into its own. Another problematical restriction: Dolbyized tapes simply can't be played back on an ordinary tape system. The A301 must be in there to expand in the right places. Without it, the dynamics and recorded sound in general will come out sounding pretty weird. But in this era of electronic music and all of its strangeness to our more conventional ears, this may well open the door to a new avenue of experimentation with electronically generated musical effects. The engineer (or musician?) may play with a console that controls the amount of Dolby expansion to be imposed on a Dolbyized tape master. And what about that A301? It's just a black box with some connectors on it. No knobs to twiddle; no meters to watch: no circuit failures to keep the service techs out of mischief. It's downright maddening! No knobs; really, Dr. Dolby!